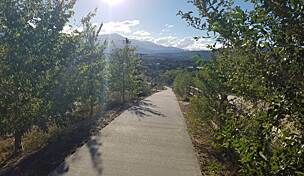 Trail end points: Foothills Trail at Vindicator Dr. and Centennial Blvd. and Pinon Valley Park at Pinon Park Dr. 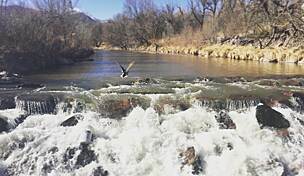 Although just over a mile long, the North Douglas Creek Trail provides access to one of Colorado Springs' natural treasures: Ute Valley Park. 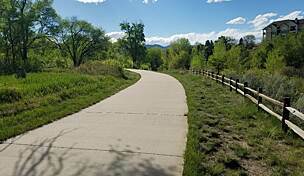 The trail begins at the intersection of Vindicator and Centennial Boulevards, where it meets the popular Foothills Trail. Although you will parallel Centennial on your way south, you'll be able to enjoy interesting views of rock formations along the way. 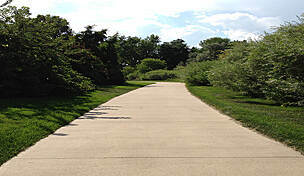 Trail-goers should note that the trail has a gravel surface along this stretch, making it best-suited for mountain bikes. As the trail continues south along an irrigation channel, the surface changes to asphalt. Near the path's southern end, you'll travel through Pinon Valley Park, a nice place to unwind with picnic tables, athletic fields and a playground. 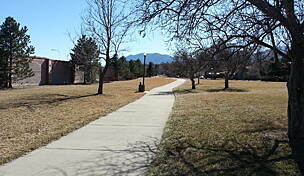 Travel east along Pinon Park Drive to reach the entrance gate for Ute Valley Park. 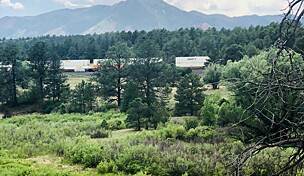 This scenic park offers lots of trees, rolling meadows and sandstone bluffs, as well as fantastic views of the mountains. For the adventurous, numerous mountain biking trails are available here, and it's also a popular place for rock climbing. 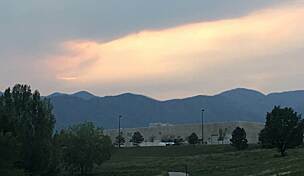 At its northern end, a parking lot is available in Ute Valley Park (1705 Vindicator Drive). At its southern end, on-street parking is available adjacent to Pinon Valley Park on both Mule Deer Drive and Pinon Park Drive.